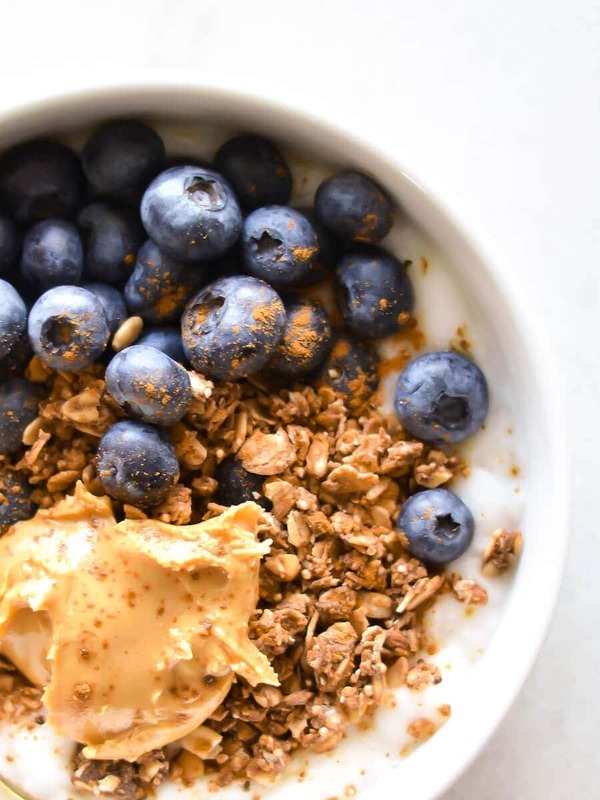 This granola and yogurt bowl is topped with fresh blueberries and almond butter. You can easily customize this quick snack or breakfast. Swap out the fruit or add additional toppings. And it only takes a few minutes to make and can easily be prepped the night before. I’m a big believer in keeping things simple. I don’t care to make recipes that take hours unless it’s a special occasion or I’m just really excited about it. If I’ve learned anything over the last few years, it’s that keeping it simple makes it a whole lot more sustainable. If you want to build life-long healthy habits, it’s always best to start simple and keep it (mostly) simple. This granola and yogurt bowl is a perfect example of that. When folks ask me if I meal plan, I tell them I just prep ingredients (so thus, ingredient plan?). I make sure that I have the primary ingredients I enjoy and use on a regular basis stocked up in my pantry and fridge every week. Then I keep my meals simple, using ingredients that are versatile and won’t sit for months between uses. I’ve always loved yogurt. But over that last couple years, I’ve been more interested in exploring dairy-free options. In the process, I stopped eating yogurt altogether. 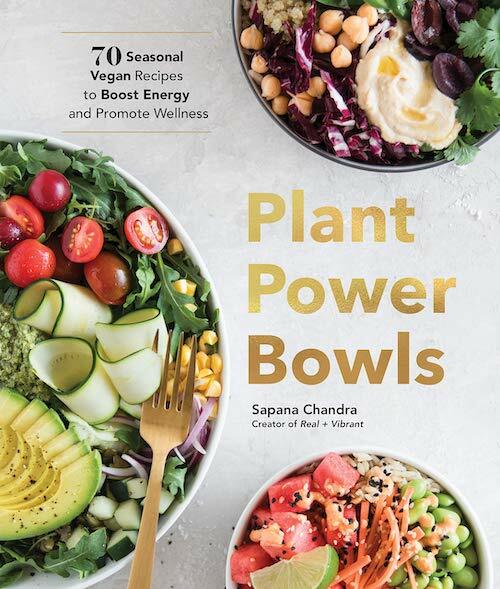 But more recently I started craving the simplicity of a yogurt bowl so I set out on a mission to find a dairy-free yogurt I love but doesn’t cause me the bloat and other digestions issues I experience with regular dairy. Besides it needing to taste good, I want this yogurt to have: no added sugar (I’m not interested in blueberry or strawberry flavored yogurts – usually, those yogurts are packed with sugar to make it taste good and quite honestly, I’d rather add my own fresh ingredients) and clean ingredients. I decided to share my search with my readers. So earlier this week, I went and bought every dairy-free soy-free option I could find at the market I frequent and decided to share my taste test with my readers on Instagram Stories. I received a ton of feedback (probably the most amount of DMs to any Story I’ve ever posted). So many folks were appreciative of me sharing my candid feedback on the various brands I tried. While I did really did enjoy some of the options I tried and will be buying them on a regular basis, I’m going to continue exploring all of the other suggestions I received! If you have any suggestions, let me know below in the comments! In any case, I just adore this combination so much. 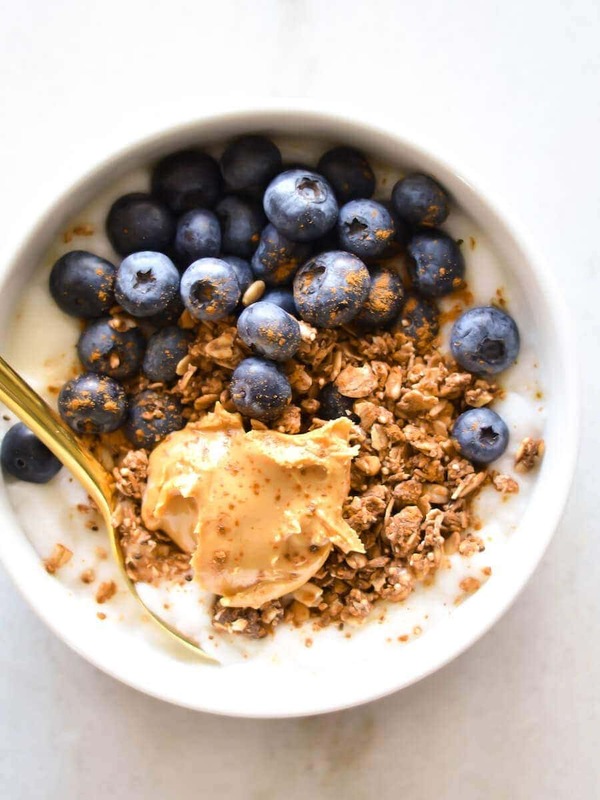 Between the fresh juicy blueberries, a creamy yogurt, some crunchy granola, and the almond butter. This is a winning combination of ingredients. You just can’t go wrong with it. And it’s easy to whip up, or even prep in advance. I sometimes make this the night before in a mason jar and throw it in the fridge. Just make sure the granola is at the top or added when you’re about to enjoy it so it doesn’t get mushy. And there are so many ways to customize it — add chia seeds, hemp seeds, cacao nibs, nuts, or anything else you love eating! I hope you enjoy this delicious breakfast. If you try this recipe, I’d love to hear what you think! Just tag your photos to #realandvibrant on Instagram. There’s truly nothing that inspires me more than seeing you guys trying out the recipes I post. Scoop some yogurt into a bowl. Feel free to use more or less depending on whether you are enjoying this as a snack or breakfast. 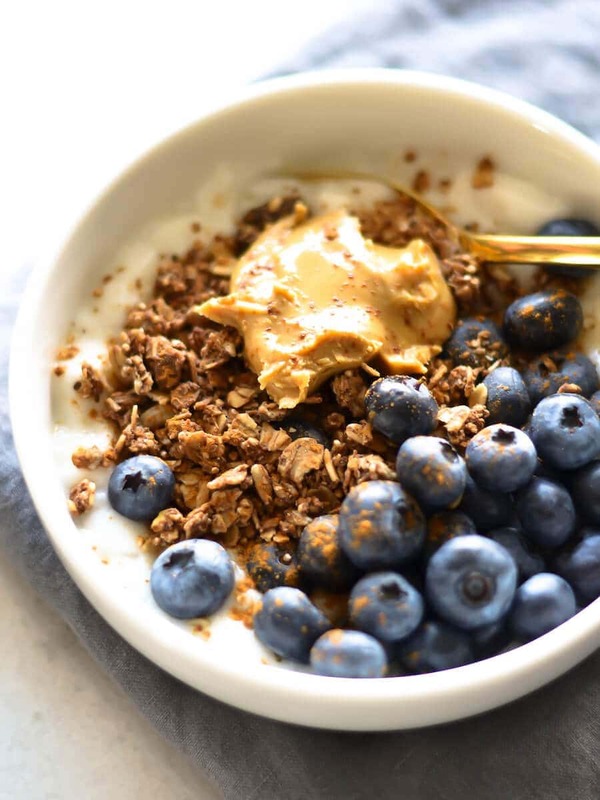 Top with your favorite granola and fresh blueberries. Sprinkle with ground cinnamon. Feel free to add additional toppings, such as chia seeds, pumpkin seeds, coconut flakes, or nuts. You can also swap out the fruit based on what you have in your kitchen.